Affordable Florida beach weddings are now easier than ever to have. We take care of the set-up, break down, officiant, photographer, permits, and more. 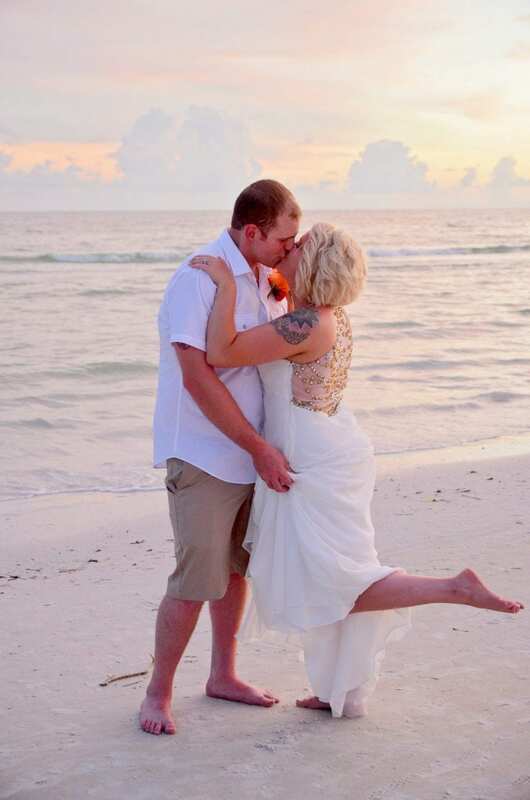 If you want to escape to a beautiful destination Florida wedding with a small group of friends and family, our Florida Nautical Knot Package is the ideal choice. Affordable Florida Beach Weddings shouldn’t mean cutting corners to save a penny. With this beach wedding package you receive beautiful decor decorated in the color scheme for your wedding. Everything included in this package is listed below. This non-refundable deposit is required to reserve your date. This deposit will be subtracted from the package price. Any permit fees that may be required, will be due at time of reservation deposit. Are you looking for a more journalistic approach to your ceremony photography? More poses, for example “trashing the dress’ or a large outlined heart in the sand? Hire our exclusive wedding photography company: Forever in Love Photos. If you hire her for your ceremony photography, she will replace our staff photographer. She will take all of your ceremony photos, as well as all the after ceremony photos at the beach. If you hire Forever in Love Photography for your beach wedding ceremony, she will take the place of our staff photographer. And, you will receive a $100.00 credit on your package when you use her photography services (this credit cannot be combined with any other discounts, and this credit is not available for the Simply Package). Once your photos are ready, you will be able to download them for free (no purchasing prints from us!). A photo CD is available upon request for only $25.00 (shipping and handling fees). You will need to contact them directly, to check their pricing, and availability. Your independently hired photographer will take the place of our ceremony photographer. You can deduct $100.00 from our package price when hiring your own photographer (not available for the Simply Package). Once the ceremony is over, your photographer will take all the guests to the water to complete your after ceremony photography. This offer cannot be combined with any other discounts. Most people dream of a Florida Beach Wedding to escape the stress of a local, formal wedding and to save thousands of dollars. Trying to plan an affordable beach wedding ceremony doesn’t mean compromising your dream. 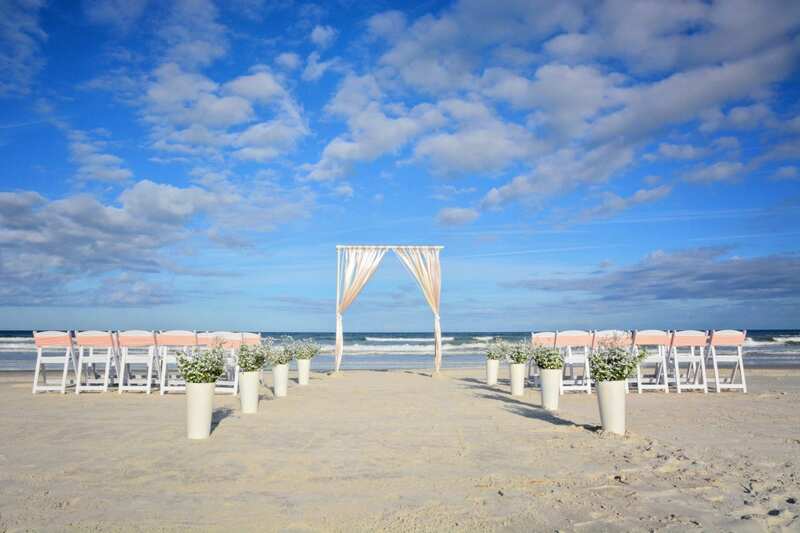 Our Affordable Florida Beach Weddings come complete with a beautiful 3 post bamboo canopy, an aisle-way, music for you to walk down the aisle, chairs for your guests, and endless ways to customize the decor to truly make it yours. Our Affordable Florida Beach Weddings are also convenient. You get to deal with one professional company instead of multiple companies, allowing you to have one direct contact for everything. We have over 10 years of experience in Florida beach weddings and can easily help answer any questions you may have. 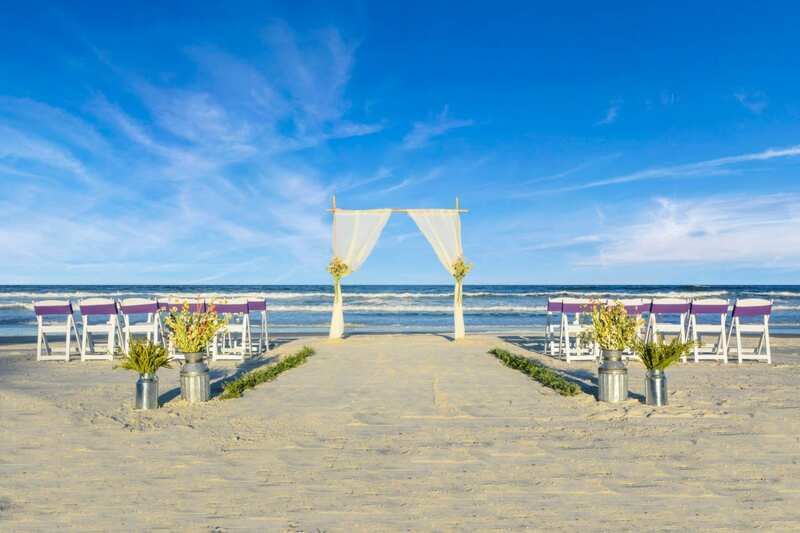 We understand that planning an affordable Florida beach wedding ceremony from a distance can be difficult, and as most of our brides are in this situation, we make it as easy as possible to see all of our decor and design your dream wedding with us from a distance. If you are ready to start planning your Florida Beach Wedding with a reliable and professional beach wedding company, contact us today.